Root rot in citrus trees is a fungal infection caused by the Phytophthora pathogen that is naturally occurring in most soils. The infection will slowly destroy the tree by causing poor growth, reduced fruit production and depleting stored energy. Phytophthora root rot is a serious disease that can spread to other plants when not controlled. 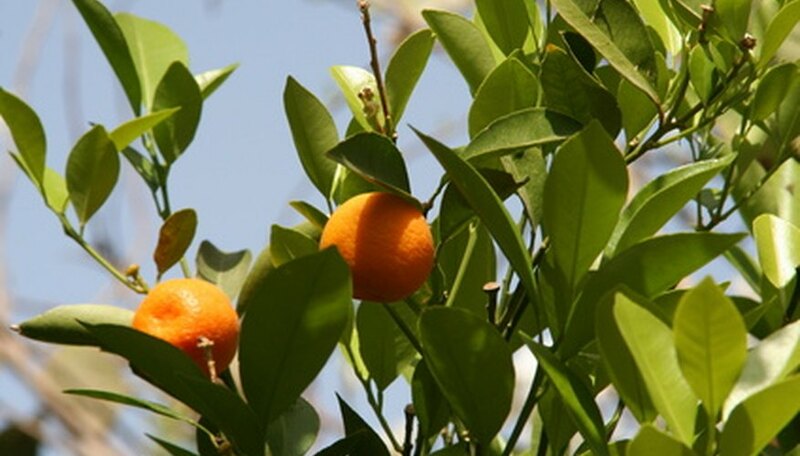 Citrus trees are susceptible to root rot from the Phytophthora fungus. The fungus is present as Phytophthora citrophthora during cool temperatures, when the roots have low resistance to infection, and Phytophthora parasitica during warm temperatures, when the roots are actively growing. Citrus trees infected with the Phytophthora fungus will show symptoms of light green or yellow leaves that fall from the tree. Phytophthora citrophthora will cause the fruit to turn brown and rot. Thin branches will begin to droop as the infection increases in severity. A suspected infection should be analyzed by a laboratory to verify the fungus present as the symptoms are similar to excess salt or water in the soil. The Phytophthora fungus infects the root cortex and destroys the root. Root rot is commonly caused from an increase in soil moisture due to flooding or a poor draining soil that becomes saturated with water. The increase in water causes an increase in spore production. The fungus becomes mobile, which increases the risk of infection. An infection causes the cortex of the fibrous roots to become soft and peal off the stele of the root. This damage prevents the flow of water and nutrients through the root and into the tree. There is no treatment that will reverse damage caused by a Phytophthora fungus infection. Fungicide applied to the soil area will prevent the spread of Phytophthora to other trees and plants. Remove and destroy infected trees once the production drops to a non-tolerable level. A Phytophthora fungus infection can be prevented by controlling soil moisture levels and not over watering wrapped tree trunks. Moisture builds up at the base of tree trunks wrapped with plastic barriers. Fire ants around the tree need to be controlled to prevent them from nesting under the tree wrap as they cause damage to the trunk and increase the risk of infection. Treat the soil with a fungicide prior to planting and plant resistant rootstocks to prevent disease. Apply fungicide to young trees or root-rot-susceptible trees to limit the chance of a Phytophthora infection.